A rustic road sign to the location of the 2018 LRMD Hamfest. 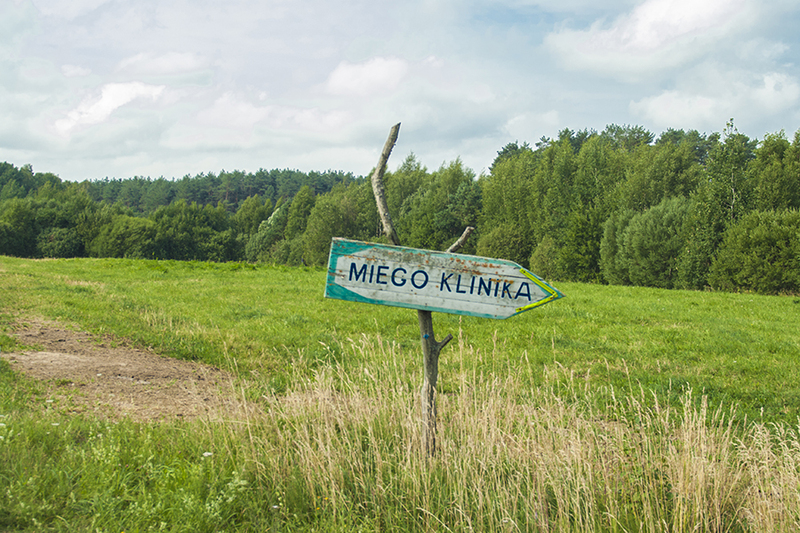 This place, called Miego Klinika - which means Sleep clinic - was far from sleepy during the weekend of July 27-29, 2018. This is a rural resort on a small lake in the middle of a forest. There are simple log huts, camping grounds and some farm animals. It is located about 10 miles or 15 km south of the medium-sized town Siauliai in the northern part of Lithuania. 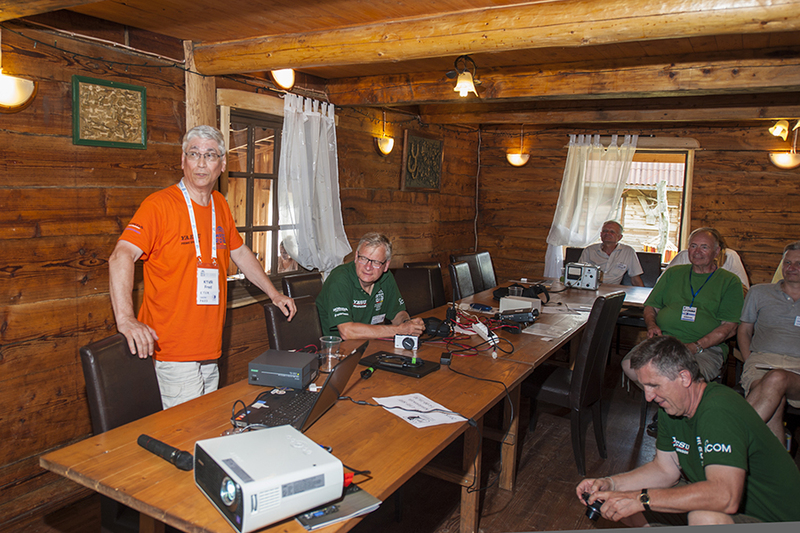 This year, the hamfest was very much DX- and contest-oriented, but there were other activities arranged as well. This is the edible logo of the meeting, carved on a 10-pound water melon by Andris, LY3AB. The initial highlight of the meeting was the ceremony of saluting the winners of the WRTC2018 competition in Germany. Only half of the winning team could attend the hamfest, though. 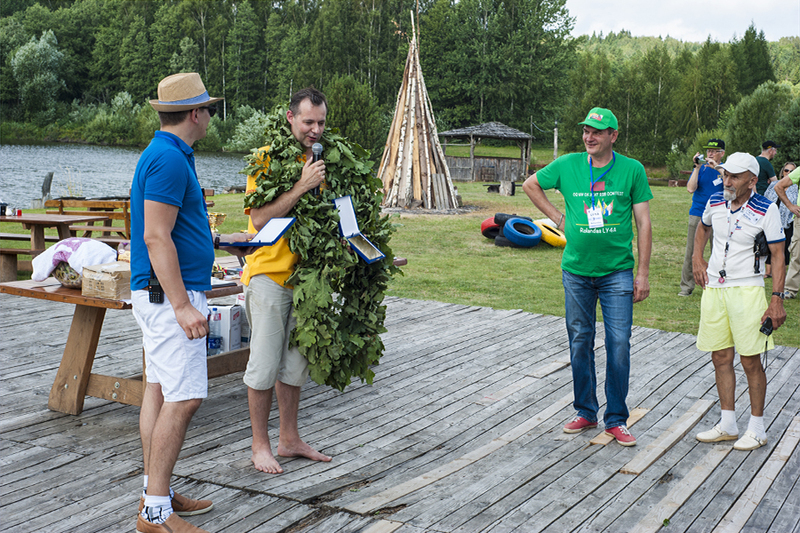 So Mindaugas, LY4L had to carry two wreaths and two medals. His partner at the WRTC2018, Gediminas, LY9A, could not come, wisely choosing a family gathering instead. Family and work go before this hobby. 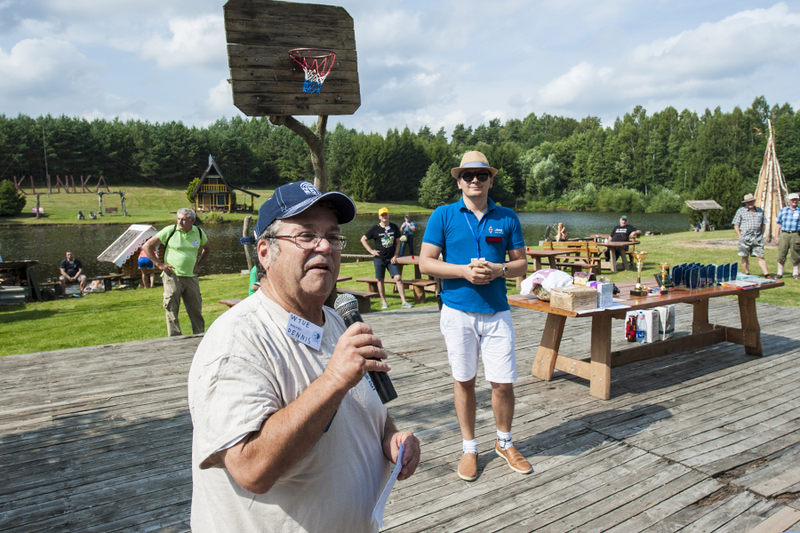 In the picture, the MC of the presentation, in blue shirt, Simonas, LY2EN - Mindaugas, LY4L, in the middle - Rolandas, LY4A, in green shirt - and Aloyzas, LY2HW. Dennis, W1UE, conveyed greetings to the hamfest participants from the Yankee Clipper Contest Club in New England. Simonas, LY2EN, is on the right. 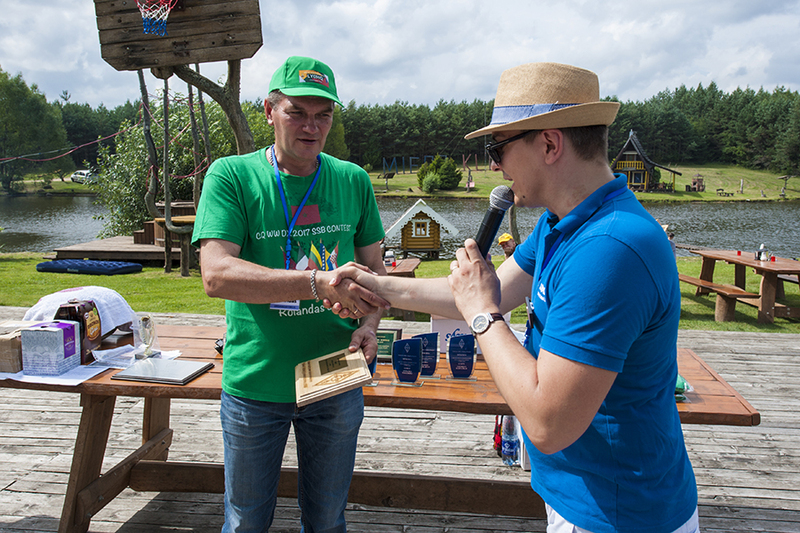 Some operators of the LY0HQ IARU HF Championship team, who were present at the hamfest, were awarded by the national organization LRMD. 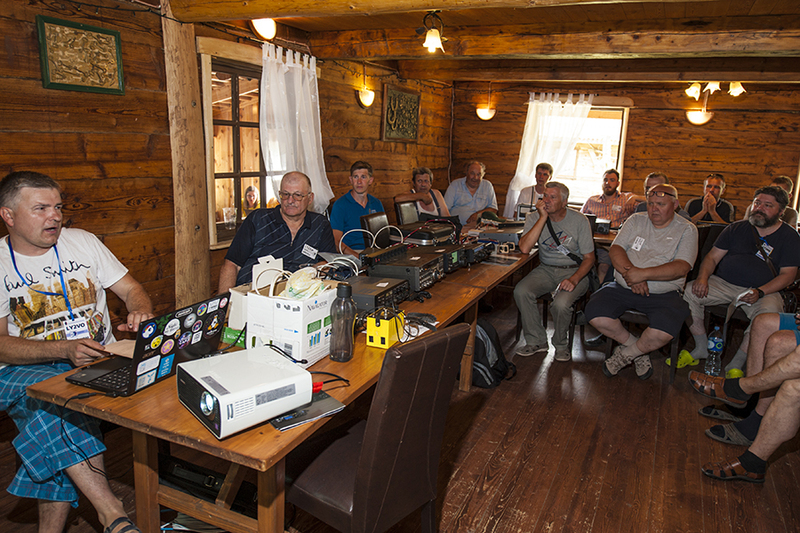 Simonas, LY2EN - right, in blue shirt - thanks Rolandas, LY4A, for organizing the hamfest. 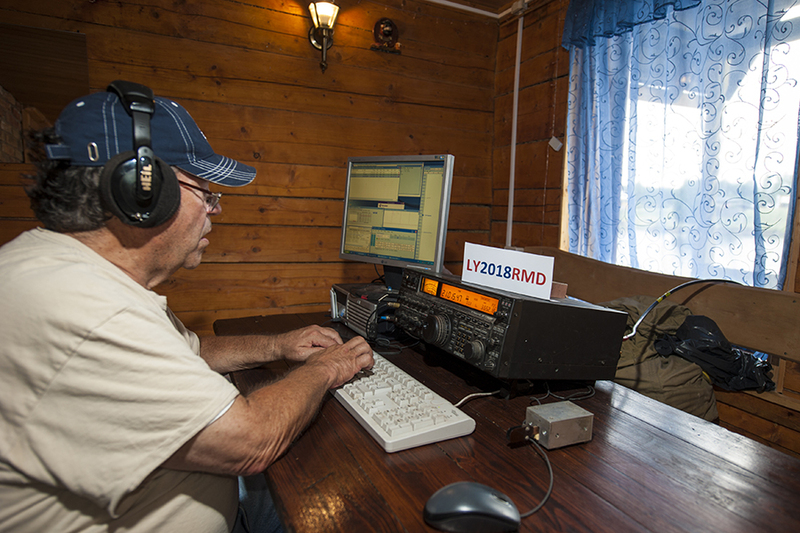 LY4A was the director of 2018 LRMD Hamfest. Time for the social part of the hamfest. 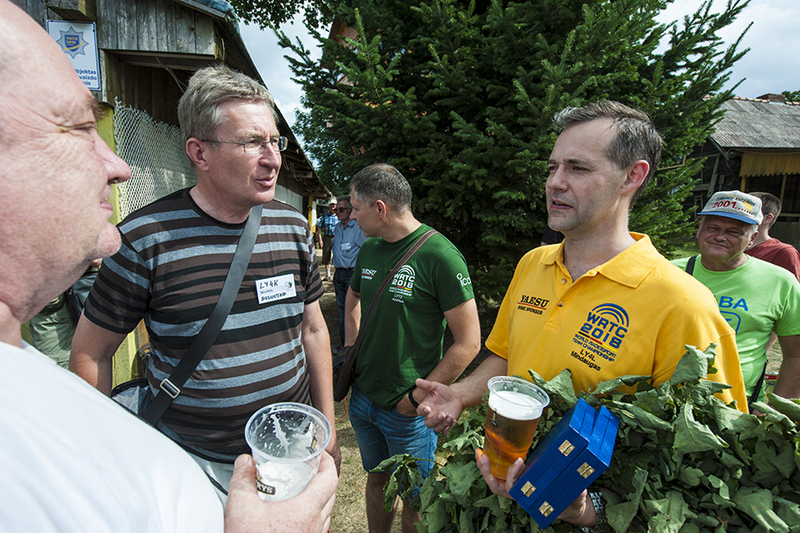 Mindaugas, LY4L - in yellow WRTC2018 shirt - talks with friends. 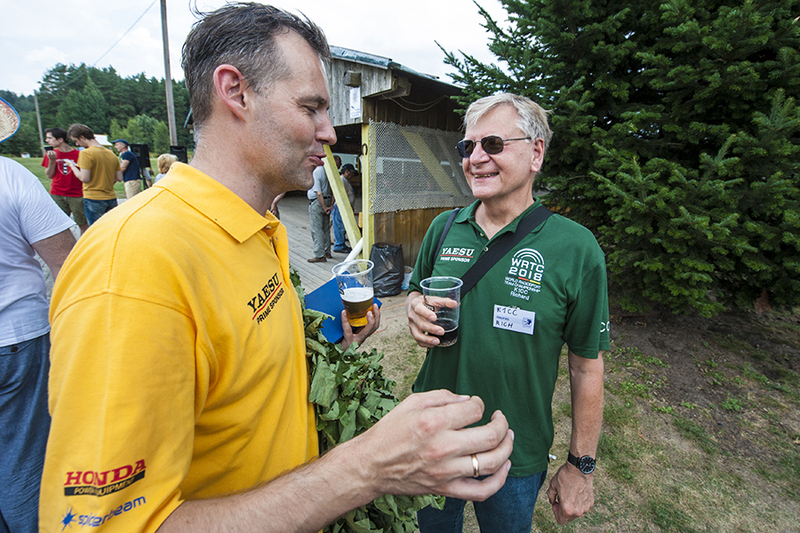 And here again, the VIP of the hamfest - Mindaugas, LY4L, in conversation with Rich, K1CC, in a green WRTC2018 referee shirt. Colourful dress, colourful food. Mindaugas, LY4L, surrounded by LY5XX and LY5YY. The hut that the LY2018RMD station was housed in, on the other side of the pond, far from the noise. 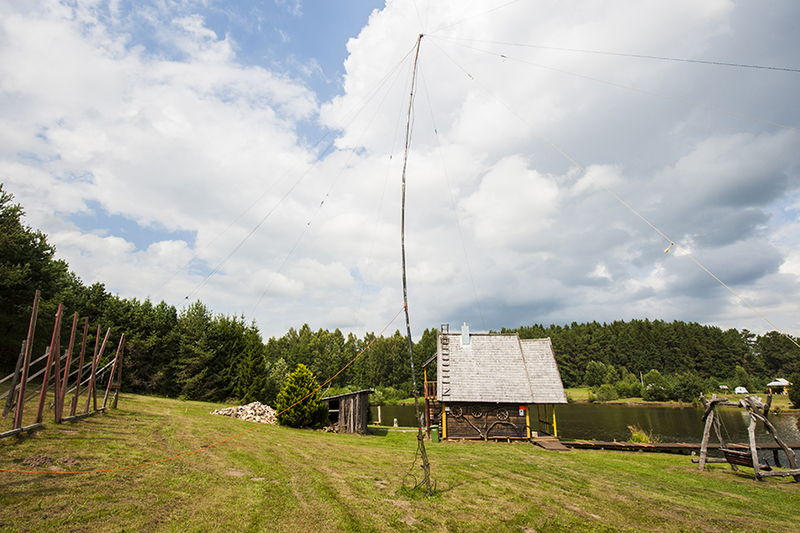 The vertical mast supports a multi-band antenna array. Inside the radio shack, Dennis, W1UE, could not resist working a couple of hundreds CW contacts from LY2018RMD. The long, but well attended, presentation of VHF and UHF techniques. A concise and humorous presentation of useful contest phrases by Fred, K1VR, from the Yankee Clipper Contest Club. Next to him is Rich, K1CC, while Wes, SP4Z, sitting on the right seems to enjoy the talk. Goodies for sale, anyone! Such things are hard to get in some parts of the world. 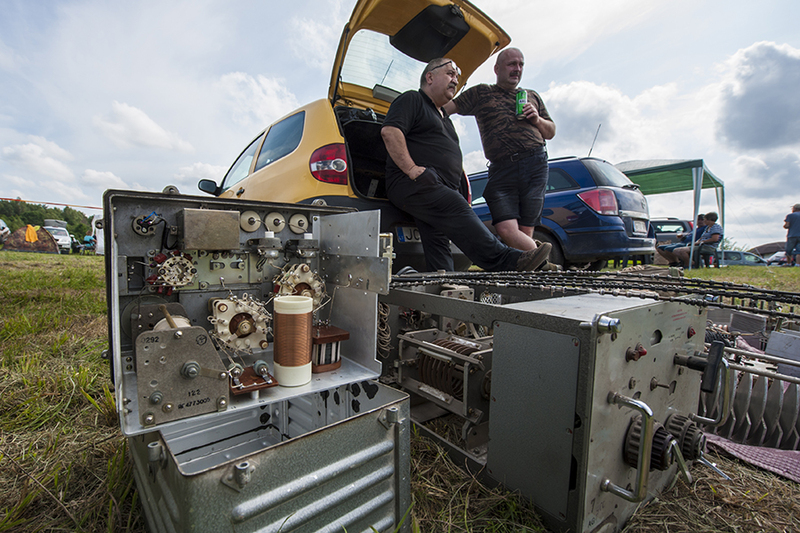 Here the remains of old, rugged radio technology are still in circulation. 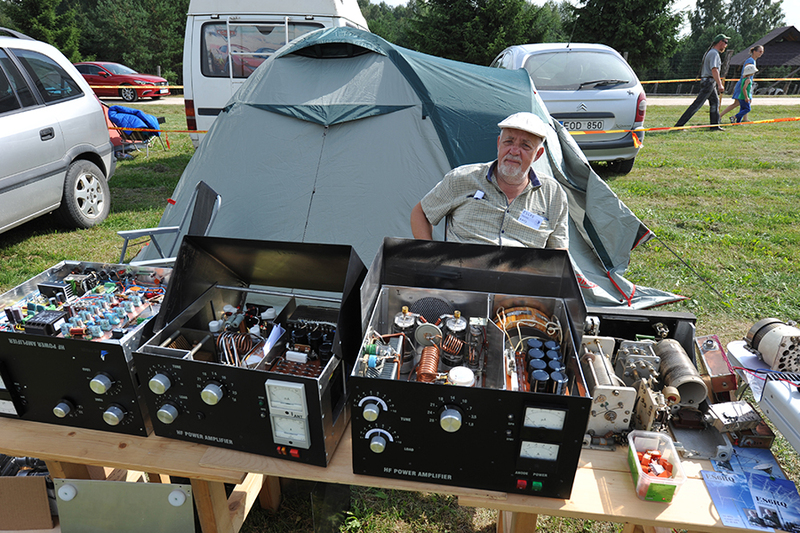 These are power amplifiers made by ES6RQ from Estonia. The spirit of constructing is still high in these regions. It might seem that this is not amateur radio related activity. 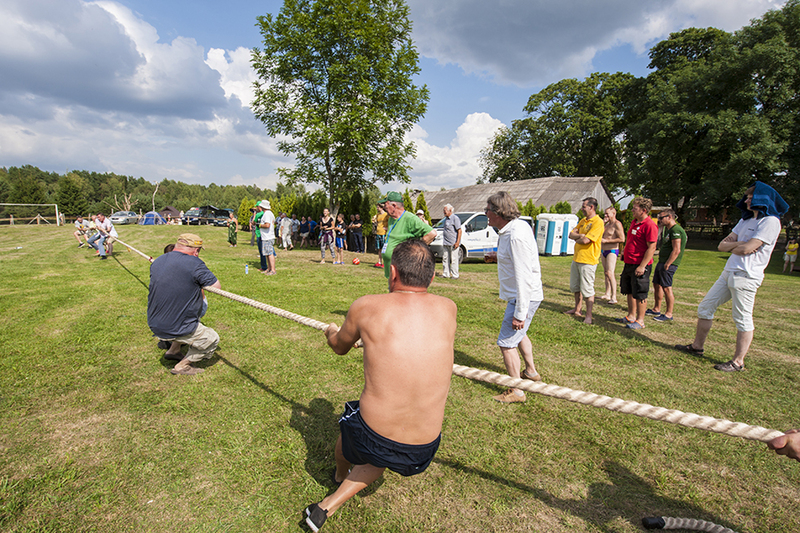 Pulling a rope by two teams was actually an attempt to answer the perpetual question - what is better - CW or SSB?. The CW and SSB teams struggled very hard, but in the end the FT8 mode was the winner. (I am joking, of course). 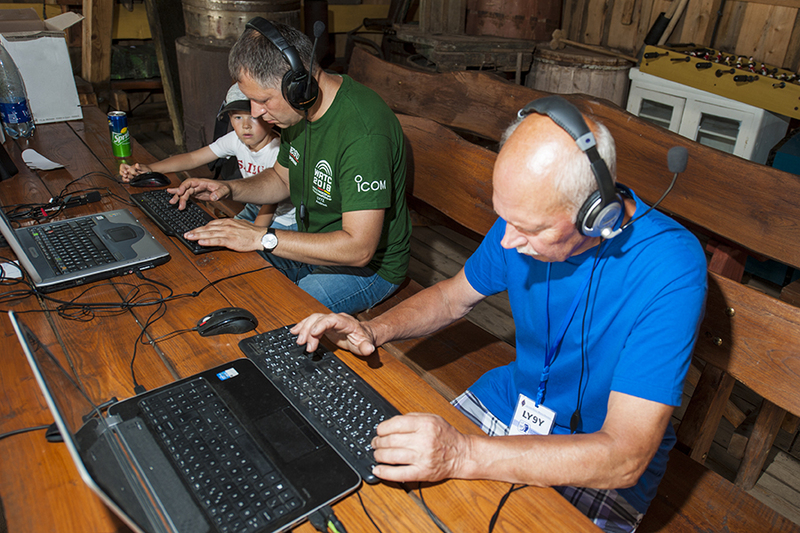 The Morse Runner competition was administered by Jurgis, LY9Y, in blue shirt. His son, Andrius, LY7Z, is in green WRTC2018 referee shirt. Behind him, his son Rokkas, most likely an excellent operator in the near future. This was tough. Straight key competition was not popular. Many of the present contesters never used a hand key, but some are still good at it. Zilvis, LY2SS, was one of them. 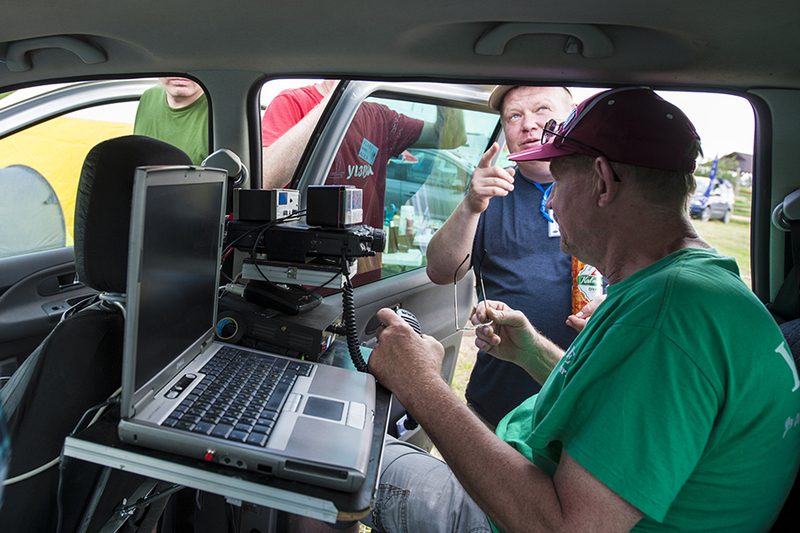 Operating from a vehicle was demonstrated by Aivars, YL3HE. He has an automatically tuned antenna on the roof of his van for HF bands. The camping ground of LRMD 2018 Hamfest. 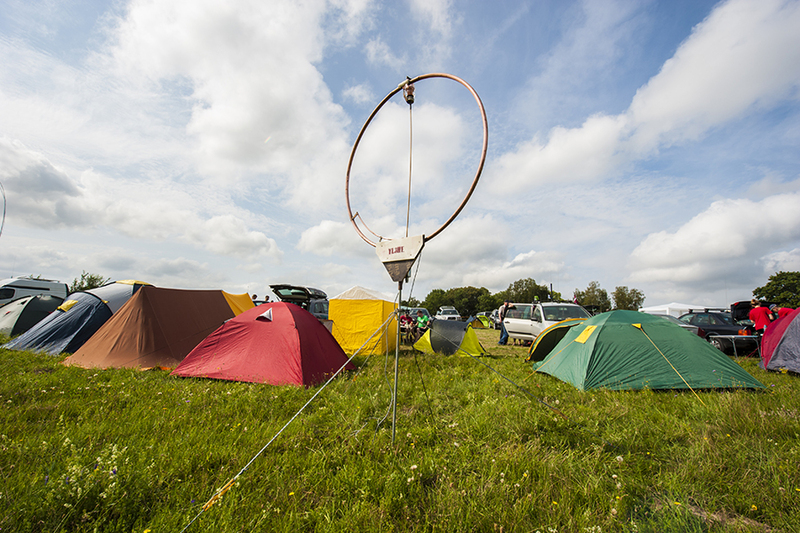 This magnetic loop antenna was set up by Aivars, YL3HE, and it works even on low bands. I am sure this report will encourage more people to come for the next LRMD Hamfest in 2019. There were more than 200 who attended the gathering this year. The location for the next year is not selected yet. Each year the Lithuanian hamfest is in a different place. The country has many suitable locations in the countryside. Nice people doing nice things in a nice place. 73, from Brazil.